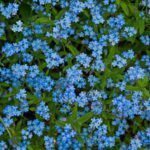 Houndstongue (Cynoglossum officinale) is in the same plant family as forget-me-nots and Virginia bluebells, but you might not want to encourage its growth. It is a poisonous herb that can kill livestock, so getting rid of houndstongue is a good idea. If you think you might have houndstongue weeds in your backyard, you’ll definitely want information about this invasive plant. Read on for houndstongue plant info and tips on how to remove houndstongue. Houndstongue is a biennial plant found in most areas of the continental United States. You’ll see it growing along roadsides, trails and other disturbed areas including pastures after overgrazing. If it’s on your land, you should be reading up on how to remove houndstongue. You can recognize houndstongue weeds if you know something about their growth cycle. The first year weeds appear as rosettes with oblong leaves that feel like a dog’s tongue, hence the name. The second year they grow to 4 feet (1.3 m.) tall and produce flowers. Each red flower produces three or four nutlets containing seeds. The nutlets are barbed and will cling to clothing and animal fur. Although the plant only reproduces from seeds, they travel far and wide by “hitching a ride” with a person or animal or even machine passing by. If you see these herbs on your property, you need to think about houndstongue control. That’s because these weeds are a nuisance to everyone. Because houndstongue nutlets attach themselves to clothing, these plants are problematic for anyone hiking through an area. It can also be an issue for pets since the nutlets often become imbedded in an animal’s fur, hair or wool. They can also will kill livestock that eat them. Although livestock generally stay away from green plants, they may eat the leaves and nutlets once they have dried. This causes liver damage that can result in their death. By acting fast to accomplish houndstongue control, you may be able to save yourself a lot of work later. You can prevent houndstongue weeds from invading your area by pulling out new plants while they are rosettes. Alternatively, you can kill first-year plants readily by spraying with 2,4-D. If you have livestock, buy only certified weed-free hay. You might also consider bringing in the root weevil Mogulones cruciger. This is a type of biocontrol that has worked well in Canada. Alternatively, you might use the weevil Mongulones borraginis that eats seeds if it has been approved in your area.